Donald E. Knuth, Companion to the Papers of Donald Knuth. Center for the Study of Language and Information, Stanford, 2012. 441+xiii pp. Paperback, US$35.00, ISBN 978-1575866345. Hardcover, US$70.00, ISBN 978-1575866352. 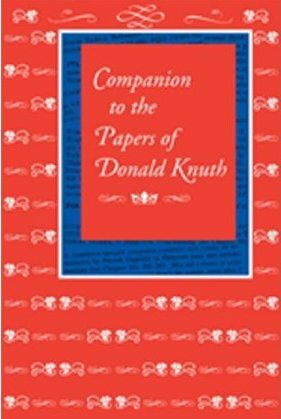 Now CSLI has published a ninth and final volume in the series: Companion to the Papers of Donald Knuth. This final volume does not completely stand alone, as the other books in the series do. Nonetheless, it is quite wonderful in its way. In the Preface, Knuth justifies creation of the present book and the series and sketches the content of the present book. The first chapter contains “six dozen” problems Knuth has submitted to various publications over the years. The second chapter contains previously unpublished solutions to a few of these problems. The solutions to the rest of the problems have been previously published, and one can find pointers to those solutions in chapter 20. The next four short chapters are small pieces that did not appear in the first eight volumes. One of these is Knuth’s well-known note on “Teach Calculus with a Big O”. Altogether there are 145 pages of these interviews following the 40 pages of the first six chapters. In my view, this first part of the book is worth at least half of the book’s price. The rest of the book is perhaps more valuable, especially in the domain of information retrieval for posterity. The last four chapters are Knuth’s CV; a comprehensive list of his books and their translations; an annotated list of his papers (in three categories: major journal publications, secondary works such as reviews and letters to editors, and works of limited circulation); an alphabetical index of titles of his papers (mostly included in the nine book series), and a combined index (names, topics, etc.) covering the entire nine volume series. The last two of these chapters take up 220 pages. These latter four chapters, especially the final two, are Knuth’s effort to make his collected papers accessible to future researchers, as well as his effort for completeness and closure on this series of books. (He states that he plans to devote full time to completion of The Art of Computer Programming.) Speaking as an owner of the prior eight books in the series, who spent a lot of time searching through them and their individual indexes while researching the content of the 2010 publication of TeX’s 25 Anniversary: A Commemorative Collection (http://tug.org/store/tug10/), this overall index is a godsend. Providing as it does accessibility to the other volumes in Knuth’s series of collected papers, I believe every library featuring books on computing should have this Companion volume, whether or not they have the other books in the series. Similarly, I think every computing history archive should have a copy. Individuals who already have several of the earlier volumes in the series will find value in this final volume in the series. And people who admire Knuth and have collected a lot of his books will definitely want a copy of this volume. As with all Knuth’s writings and edited presentations and interviews, the non-lists-and-indexes part of the book is fascinating reading. The lists-and-indexes part of the book is up to Knuth’s usual perfectionist standards. I am glad I now have this volume on my bookshelf.